↑ Lane, Jo. "Asia's love affair with the rickshaw". asiancorrespondent.com. asiancorrespondent.com. Retrieved 2015-07-30. 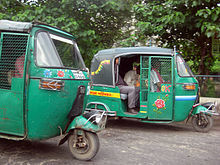 ↑ "Police purge for Dhaka rickshaws". BBC Mews. December 20, 2002. Retrieved 2011-03-22. ↑ Pippa de Bruyn; Keith Bain; David Allardice; Shonar Joshi. Frommer's India (Fourth ed.). 2010: John Wiley and Sons. pp. 15, 57, 156. ISBN 0470645806. ↑ Pippa de Bruyn; Keith Bain; David Allardice; Shonar Joshi. Frommer's India (Fourth ed.). 2010: John Wiley and Sons. pp. 57–58, 110. ISBN 0470645806.